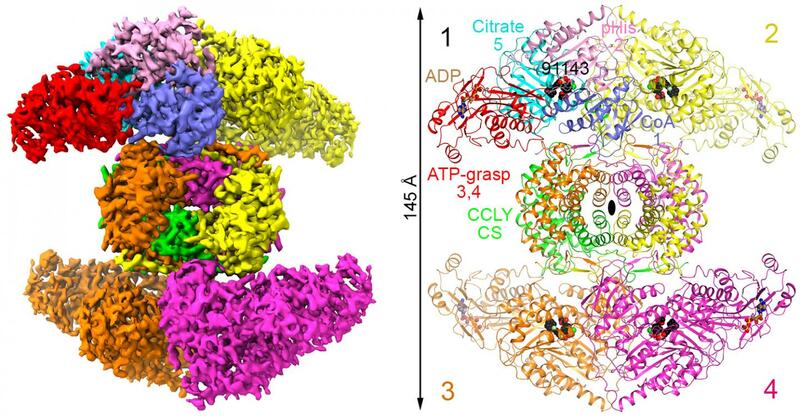 The team has successfully determined the 3D structure of human ATP-citrate lyase (ACLY)–which plays a key role in cancer cell proliferation and other cellular processes–for the first time. ACLY has been found to be over-expressed in several types of cancers and experiments have found that “turning off” ACLY leads cancer cells to stop growing and dividing. Knowledge of the complex molecular architecture of ACLY will point to the best areas to focus on for inhibition, paving the way for targeted drug development. The cryo-EM results revealed an unexpected mechanism for effective inhibition of ACLY. The team found that a significant change in the enzyme’s structure is needed for the inhibitor to bind. This structural change then indirectly blocks a substrate from binding to ACLY, preventing enzyme activity from occurring as it should. This novel mechanism of ACLY inhibition could provide a better approach for developing drugs to treat cancer and metabolic disorders. The portion of the study, “An allosteric mechanism for potent inhibition of human ATP-citrate lyase,” conducted in Liang Tong’s laboratory, was funded by a grant from Nimbus Therapeutics. Some of this work was performed at the Simons Electron Microscopy Center and National Resource for Automated Molecular Microscopy, located in New York Structural Biology Center, supported by grants from the Simons Foundation (349247), NYSTAR and the NIH National Institute of General Medical Sciences (GM103310). Liang Tong is a consultant for Nimbus.